Honestly, I didn't like playing Bach so much when I was younger. I understood how intellectual his music was, and that his works were well-done, but I didn't feel much joy in playing Bach, not like other composers. One day, a pianist changed my mind. I met him on a video, since he was already dead at that time. When he started playing Partita No.2, with a lowered head, like a man possessed, my skin started tingling. How vivid and active and fresh his Bach was! It was perfectly clear that when he was playing, he was filled with joy. After that experience, I became a fan of Glenn Gould. He heightened my desire to play Bach, and made me recognize the magnificence of Bach by other pianists, such as Edwin Fischer or Andras Schiff. 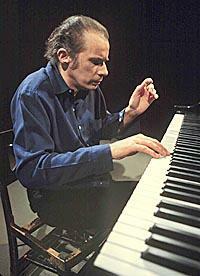 I love listening to Glenn Gould, however I avoid recordings of pieces which I am working on. I don't want to copy him. His style is wonderful because it's Glenn Gould who is playing. If I play like him, it is an imitation, and nothing more. I must play my Bach. Sometimes, people criticize the fact that Gould gave up performing in public and devoted himself to recording. I agree with this to some extent, because I think pianist's life is on stage. Still, it is an undeniable fact that nobody ever played Bach like him, and that he pleased a lot of people.